Pick&Move West Hampstead Removals are specialists in relocating your family or office in NW6 so you can relax knowing you’re in good hands. We are local and covering the whole area of NW6 West Hampstead you can be assured that you will receive a professional, reliable and honest service every time. We aim not only to provide top quality service, but we are also focused on providing the most discreet and respectful customer relationship. Your relocation is our priority and we will do all we can to ensure your experience of dealing with us is as smooth as possible. We pride ourselves on making the move as easy for our customers as possible. Our full relocation service in Hampstead offers a packing and dismantling service, relocation of your offices, unpacking and putting the desks and cabinets back together and removing all the rubbish. NW6 staff will protect your home and personal belongings by using the right packing supplies and specialized equipment to move your furniture carefully, for instance your big items such as: furniture, electronics, big mirrors, pianos, paintings, glass or marble table tops and other big items are packed and wrapped up properly blankets. In addition we will dissemble and reassemble any items for you in NW6. We can also unpack at your request. Our courteous, prompt and experienced staff will meet all your moving needs. You can trust removals NW6 to make the moving experience a stress-free and enjoyable one. Expanding your Business or Just Simply Relocating in NW6. Minimising disruption is our ultimate aim, we can arrange the whole office relocation for you. planning and carrying out any risk assessment to ensure all goes as planned. If during a normal business day is not ideal we can come in and relocate your business on a Saturday to minimise disruption. This option is great for the smaller house or business who may not need a lot done. We offer Van 1, 2 or 3 men service for local moves. Furniture dismantled and reassemble for home or office, we load and unload into your new destination. Book your Man and Van team today and experience the difference. We Are Cheaper Than Self Storage in NW6. Need something stored either short or long-term in West Hampstead? Call today to discuss the best option to store your important possessions. 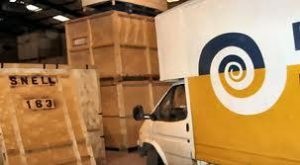 We are Mobile Storage alternative collection from your home or office in NW6, you never need to visit storage facilities again. With a wide range of storage sizes available, you can be sure to find something to suit your requirements. Secure, clean free of moisture or humidity complete with CCTV 24/7. All brancheshave state-of-the-art facilities for short and long term storage belongings. Pic&Move international relocations company, specialising in international removals, storage, overseas moving, movers insurance, relocation services and lots more Pick&Move furniture movers are professionally trained to handle your prized possessions. Contact our professional international moving consultants for an obligation-free in-house visit to discuss your international moving requirements. We cover most overseas destination, Full container load (FCL) or Less than container load (LCL) with full packing , customs clearance and delivery door to door at your chosen destination. West Hampstead is an area in northwestern London, England, situated between Childs Hill to the north, Frognal and Hampstead to the north-east, Swiss Cottage to the east, Kilburn to the south-west, and South Hampstead to the south. Until the late 19th century, the locale was a small village called West End. Modern West Hampstead emerged with the arrival of the railways, and the transformation of the area from farm land to housing estates. In 1879, the Metropolitan Railway adopted the name West Hampstead for its station on West End Lane, the main road through the area. Its motivation seemed to be to avoid confusion with the main retail area in central London, which was also known as the West End. West Hampstead’s proximity to the Metropolitan line at Finchley Road and its own Jubilee line stop (West Hampstead), together with a high concentration of bars and restaurants, means that the area is a popular leisure destination for people who live in the northwestern part of London. West End Lane itself is home to a number of cafes, bakeries and small shops, creating a “village” atmosphere during the day. In addition to the aforementioned London Underground links, West Hampstead is also served by West Hampstead railway station and West Hampstead Thameslink railway station.